Joe Biel is a self-made autistic publisher and filmmaker who draws origins, inspiration, and methods from punk rock. He is the founder/manager of Microcosm Publishing and co-founder of the Portland Zine Symposium. He has been featured in Time Magazine, Publisher’s Weekly, Art of Autism, Utne Reader, Oregonian, Broken Pencil, Punk Planet, Bulletproof Radio, Spectator (Japan), G33K (Korea), and Maximum Rocknroll. He is the author of A People’s Guide to Publishing: Building a Successful, Sustainable, Meaningful Book Business, Good Trouble: Building a Successful Life & Business on the Spectrum, Manspressions: Decoding Men’s Behavior, Make a Zine, The CIA Makes Science Fiction Unexciting, Proud to be Retarded, Bicycle Culture Rising, and more. 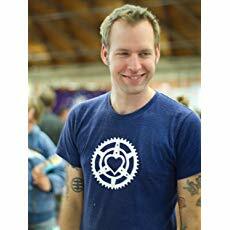 He is the director of five feature films and hundreds of short films, including Aftermass: Bicycling in a Post-Critical Mass Portland, $100 & A T-Shirt, and the Groundswell film series. The Journal of Adolescent & Adult Literacy described Biel as “not trained in pedagogy.” He lives in Portland, Oregon and his work can be found at joebiel.net. Ed Battistella: What is A People’s Guide to Publishing? Joe Biel: After twenty years of publishing, I met Sidnee Grubb, who is one of the smartest and most promising young people that I’ve ever met. In fact, she’s two months younger than Microcosm! She completed an internship here and asked what to read to further her publishing education. I thought long and hard about this and ultimately felt like all of the books were outdated, too academic/jargonified, or promising to teach how to get rich quick on Amazon. It made me really sad to think that if I was getting started today—despite millions of books in print—there wasn’t a single definitive book written about publishing written in plain language. So I wrote one for Sidnee because I saw so much promise in her. EB: What prompted you to write the book? There is plenty of nitty-gritty detail—about covers and book design, margins and printers, sales, contracts, fulfillment and more. But you also talk about having a mission and a vision. How important is that? 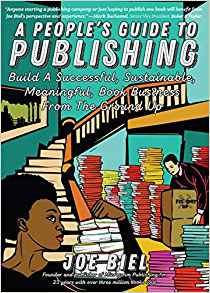 JB: Around the same time that I met Sidnee, I had just read Publishing for Profit, which is truly an excellent book. Unfortunately, if I hadn’t been publishing for 20 years, there is no way that I could have made sense of what the author is saying in it. It’s very complicated. I wanted to make publishing sound as simple as possible. Publishing is very contextual and there are many moving parts but very little changes quickly and I feel like there is still great opportunity—more than ever—for new small presses to thrive and carve out their own microcosms. And I think you’re astute to notice that mission and vision is why small presses and midlists are growing and thriving now while the market share of the majors is shrinking. There is a strange aversion to having politics in publishing as the rest of the world is increasingly politicized. I think this is a tremendous misstep. EB: You mention something called “long-tail development”. What is that? JB: After overprinting, the number two mistake that I see in publishing is creating a book that will appear outdated in a few months or a year. Most book sales resemble a half sine wave and the greatest sales are in the first three months with sales hovering around zero after a year. Small presses shouldn’t be publishing current events books like Fire and Fury. We need to be focusing on evergreen books that will be just as relevant in two years, five years, and two decades. Another trick here is to publish books that you can introduce to multiple markets, from trade to gift to special sales to mass market to international to digital. If you follow my advice and ensure that there is sufficient interest and lack of competition, it’s very easy to launch a series of long-tail titles that sell each other. EB: You also discuss the future of publishing. How do you see that? What’s the role of small independent publishers? JB: This is about the cheeriest news that I found in all of my research: the future of publishing belongs to the small press. If you pick a niche that isn’t occupied following my formulas, there is tremendous room to grow and own that platform. From all of the data it appears that the role of major houses will increasingly become solely about buying rights for books that are already successful and outside of the bounds of a midlist or small press. 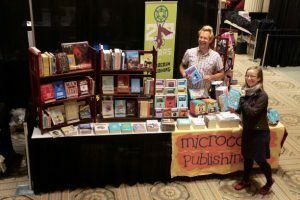 Increasingly, the role of the small press is to take chances, do interesting things, create trends, and change the world. EB: You’ve been in publishing now for almost twenty-five years. What’s your favorite thing about the business? Your least favorite thing? JB: I still really enjoy group development sessions and editorial meetings. I involve the whole staff, including the warehouse and the warehouse workers always have the best editorial, marketing, and development ideas. I do find the increasing volume of paperwork and corporatization as well as the resulting demands of the industry to be tedious, pointless, and migraine inducing. When I was a kid I hated corporations because I was a punk rocker and that was en vogue. Now I have substance and specifics that I can point to explain how those has effectively crippled the industry across Sidnee’s lifetime. EB: If you were to give new publishers one word of advice, what would it be? EB: Thanks for talking with us. I’m looking forward to using the book with students! JB: Wonderful! Thanks so much for believing in this book! We had to delay publication three times because I kept missing my deadlines. I was too busy publishing! This entry was posted in History of Publishing Observations, Ideas and Opinions, Interviews. Bookmark the permalink.